The Worship Team of our congregation does our best to create a Sunday morning that brings comfort, joy, challenge, emotional depth and sacred space. Our services begin at 11AM, normally with all ages beginning worship together, and the children going off to class during the service. 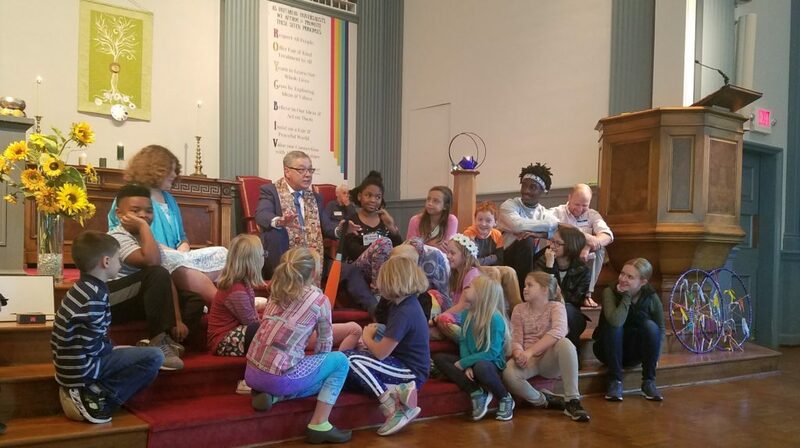 Once monthly we have an All Ages Service in which we all stay together for the whole time in services designed especially, but not exclusively, with the youngest members of our community in mind. On Sunday morning you may hear any of our four regular choirs, The Chancel Choir, the Women’s Ensemble, the Men’s Ensemble, the YoUUth Choir or even take part in what we call “Pick Up Choir.” The latter choir is made up on the spot of any volunteer who wants to sing at the moment. Though the content is probably different than most Protestant Christian churches, our Order of Service clearly shows our roots and commonality with our Christian friends. You’ll recognize many of the same elements. An opening, a song, a reading, a sermon, and hymns to sing. Most weeks we have a reading from what we call Wisdom of the Global Scripture. We take this opportunity to read from texts both ancient and current, both sacred and secular. You are likely to hear poetry from modern masters, blog posts about hot topics, or stories about the human condition lifted from our common human history. For most of our history as a faith, we have been a safe home for families of differing faith backgrounds. We are a non-creedal faith, meaning there is no one core belief that we all must share. In any given Sunday you may share a pew with someone who is Christian, Muslim, Buddhist, Jewish, Pagan, Humanist, Atheist, Agnostic or some combination of these and more. We welcome families of one, chosen families and families of origin. We welcome people who identify all along the gender and racial identity continuums in our religious community. We are a gathering of human beings who do our best to live our best lives. We make mistakes. We try to apologize when we’re wrong. We try to show grace when the limitations of others become evident. We would love to share a pew with you on a Sunday. Maybe this Sunday!